First images of my latest project . .
My Spring Creativity Has Sparked! After nearly a year of creative hiatus, I am excited to share the first images of my new project. Since last August I have been focusing on improving my craft as a middle and high school Algebra teacher. I am inspired by my students to create a new series of prints weaving together math, art, and history. These two mini prints are just me getting my feet wet–I’m also working on a larger print that I’ll share more about later . . .
Pumpkins and . . .
. . . apples are now available as cards! Re-purposed thread spools now hold embroidery floss! My colleague June Albright at the Upper Valley Waldorf School just showed me how to take tangled snarls of embroidery floss and wrap them around empty thread spools for easy storage. So much nicer than the mess they were before, and more beautiful! Other exciting news this week: I finished my Sami inspired reindeer bag! A beautiful new handwork bag. Which means I am allowed to start my next project involving mini stamps. Pictured below are the underworld, a tree, a boat, a fishing net, and a border. Mini blocks awaiting their destiny in a larger project . . . to be continued! I made this amazing purple star at my math workshop last weekend at The Nature Institute in Ghent, NY. I’m pleased with the coloring (I’m not always that patient!) and I’m pleased with the math: I learned all kinds of cool things you can do with pentagons, pentagrams, and the Golden Ratio. I love finding deep problems that you can teach to people at a variety of levels–6th grade through Calculus. I’m looking forward to taking another class there sometime soon. 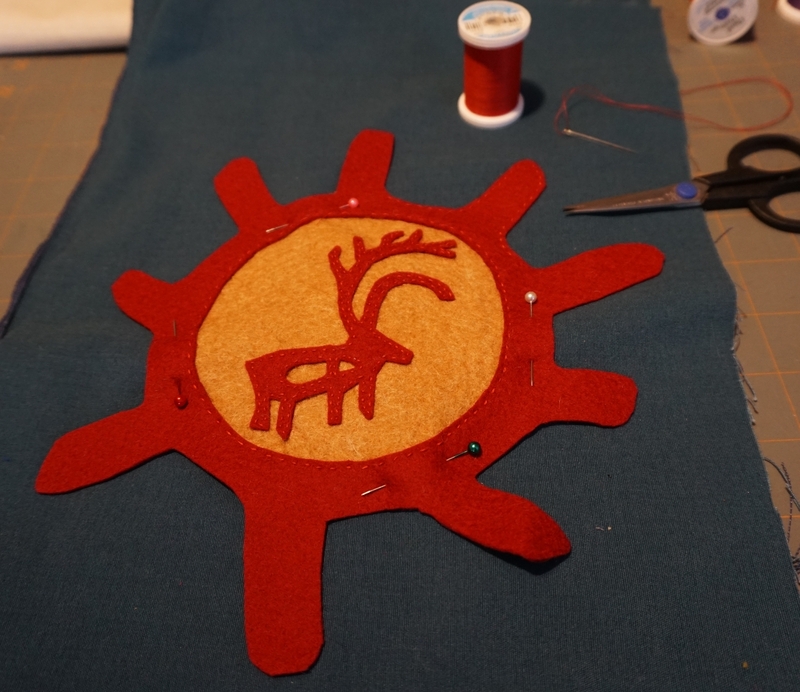 Reindeer and sun symbols combined in felt on what will become a craft bag. I’m getting ready for my summer trip to Iceland and Finland by immersing myself in some beautiful images. This reindeer is from a book called Scandinavian Folk Patterns, and the sun framing it I found online researching Sami drum symbols. Felt is one of my favorite fabrics to sew because you don’t need to hem it and it makes big bold lines and shapes similar to the ones I like to use in my block prints.